Psychedelic Posters and Art: But Is It Art? This paper was presented at a panel at the American Anthropological Association meetings, December 2, 1998 in Philadelphia entitled Seeing Culture: The Anthropology of Visual Communication at Temple University. Do not cite without author's permission. This paper is an attempt to further refine the study of how 'meaning' is constructed in art. I will do this by looking at an art form, I believe it can be labeled as such, psychedelic poster art, which is in what appears to be the initial stages of being dislodged from its original popular context and elevated towards the realm of Art with a capital 'A'. In the last decade increasing attention has been placed on the appropriation and manipulation of artifacts and material culture by art, historic and ethnographic museums. Work by Clifford , Karp and Lavine , and Price  initially pointed to the ways in which objects are cut out of one context and placed in another. In the process they reemerge representing very different condensed form of 'exemplary or idealized culture'. I hope to provide a brief indication here of some complexities of this process that I believe have so far been overlooked. As we can see this is a pipe. But when this line is added we as viewers are confounded by contradictory messages in two different visual codes. We are thus forced by the inherent contradiction to more consciously rethink how we generate meaning from pictorial and written communication. Foucault's book of the same name published in the mid-80s posited an important analysis of visual communicative practice on this representational dilemma. Among other points, Foucault indicates the extent to which we confuse signifiers for sign/objects in pictoral codes of communication. Barthes has helped in this effort by demonstrating how such "second order sign systems" are ordered to carry meaning. 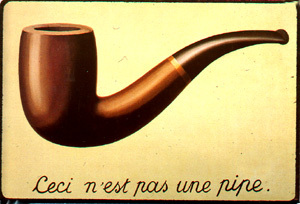 In this instance, for example, a very specific object is referenced, not just any pipe but a 30s-60s 'modern', simple, not too expensive, dad and his slippers plain briar pipe, not clay, not carved, not meerschaum, not long stemmed, not out of pipestone, without feathers or other ornamentation and so on. While this in one sense negates Sol Worth insight that "pictures can't say ain't" by limiting possibilities and referencing a particular, specified pipe, there is another sense in which its meaning as communication is ambivalent, or open. That is, when I produce a signification from this signifier I may associate it fondly with my grandfather and the midwest, farming and a slower, more community oriented lifestyle. For someone else it may signify lung cancer and the negativity now surrounding tobacco use, or it may signify woman's suffrage through an association with a revolutionary grandmother. This variability of signification is a vital point because whether or not Foucault has successfully decoded the message Marguerite intended to send in the 30s, the first thing that most of us have been taught to do in decoding these signifiers, is to recognize an object/ sign, a particular Marguerite painting, or failing that, a surrealist painting. To use Barthes and Foucault's terms for the control social institutions exert to discipline subjects, experience and communication, the above example indicates that in our culture art historians and museums control the primary "mythology" or "discourse" through which signifiers deemed artistic realize meaning. This mythology places works by important individual artists together by stylistic similarities and then locates works in an evolutionary progression of form and aesthetics. In this discourse context and history, the social and natural environments artists inhabit and respond to, are largely absent. As Becker, Moulin and others [1982; 1987] have indicated, museums that legitimate Culture with a capital 'C' in the form of Art with a capital 'A' are assumed to operate under the auspices of art specialists, but are, in fact, doubly controlled by elites who sit on the boards of directors and frequently contribute the buildings and/ or the endowments to fund public access to art. The collections of Art themselves are often assembled by the logic, collecting proclivities, or to use Bourdieu's term , "tastes" of a few wealthy collectors whose public largesse is encouraged by the state through enormous tax benefits. Not surprisingly, values such as individual greatness and achievement are promoted so that viewers can find them in work by artists even several centuries old. However, in the last fifty years art auctions, particularly those arranged by a few powerful institutions such as Sothby's and Christi's, have had a profound effect on how art is valued. Bonnie Burnham  has documented how an "art boom" was initiated in the 1950's through the ideology that anyone could be an art collector coupled with the promotion of art as a financially sound investment vehicle. Sothby's instituted "the 100 pound rule", frequent auctions of art costing less than 100 pounds, to expand middle class collecting. Concurrently their public relations department increasingly related 'rags to riches' stories to the press in which the auction house served as a 'do-gooder' intermediary. This is a context in which the 'best art' is legitimated by the highest price, and rarity and originality are vital forces in price appreciation. The discourse of the importance of works of art in this context has had a profound effect on how art is 'valued' by stretching the thin skin of artistic merit taught over a bloated economic belly. Yet there are two more contexts that produce art discursively. Howard Becker makes an essential distinction in the next context, galleries and dealers. This is between dealers in "consecrated" or "contemporary" art. Since consecrated Art is already art with a capital 'A', that is, already recognized by society or its aesthetic judges as having exceptionally important qualities or high value, its agents are primarily concerned with promoting its rarity and policing its authenticity. Their discourse is thus parallel that of the auction houses albeit generally more refined. These dealers reference art works which become signifiers signifying the social status of the collector to which the referent money drops out. Contemporary dealers, on the other hand, work to legitimate artists and art they represent. As Moulin says, "entrepreneurial dealers seek to integrate the painter into the market." [1987:179]. Typically using an established language of aesthetics to cultivate a 'taste' among the public for artwork they represent, they make work able to be valued, or 'value-able'. Finally, there are the folk arts, what I call hyphenated art. These are marked categories of art, never identified solely as art but rather art introduced by an adjective, e.g. poster, graphic, primitive, folk, naive, low. Though the defining features are often vague or misleading, such art is considered closer to social activity and distanced from aesthetic purity. It is often handled or consumed tactually. It may also have an instrumental function and may be mass produced thus denying the status of 'unique object'. While the work of auction houses and some dealers to put the imprimatur of art on anything 'collectable' has problematized 'aesthetic value', aestheticians have refigured the terrain by inviting such forms of art into the museum or into art books which highly promote the adjectival condition of their association with unmarked and thus pure art. For instance consider the Museum of Modern Art in New York's 1991 show "High and Low in Art" which, in addition to the show, spent two books and 700 pages legitimizing the distinction it represented to the public. Posters are usually consider a low art, but there are some interesting reversals. For instance, cheaply reproduced text and images harnessed to sell products and designed in the late 1800s and early 1900s by Ceret, Mucha, Toulouse-Lautrec, Will Bradley, Maxfield-Parrish have come to be appreciated as Art with a capital 'A'. Yet fine lithographic reproductions of paintings, for example Toulouse-Lautrec own works, are certainly low art, if they can be even be accepted as such. Poster art represents the realm of the popular and many of these posters were popular in their own time. Nevertheless, recognition of them by the legitimating institutions of art was, and is still, most often in the form of critique. In their discourses, posters are illegitimate as art or degenerate, associated with moral turpitude and the reproduction of delegitimate forms of culture. In 19th century Paris these are represented by the morally loose, suffragette women represented in early bicycle posters or worse, the high kicking women of Toulouse-Lautrec's now famous poster for Jane Avril's licentious cabaret. Presently however, this controlling discourse has been transformed into, an aestheticizing discourse of stylistic innovation tied to impressionism and another of price appreciation as, one of the seventeen extant Jane Avril posters sold at Sothby's for 250,000 dollars in 1986. When I began writing the chapter of my thesis on psychedelic posters in the current art market, naturally I looked to what anthropologists were saying. Most of this focused on what I identified earlier as art being cut out of one context and reintroduced into another. The art was also usually a form of low art conditioned by the adjective 'primitive'. At first I found these useful, particularly Clifford's "semiotic square". Based on the work of Greimas and Jameson, it maps the terrain 'primitive' art covers in our society, being moved if it can be, to states or places in which it will be considered to have greater value. On this map it would mean moving from the fourth zone as an "inauthentic artifact" to the first zone as an "authentic masterpiece". Psychedelic poster art would enter most likely in the fourth zone as a utility, or commercial and reproduced "not-art". It also might enter through zone three as a new form of "anti-art". But where I began to have problems was when I considered their entry into zone one, controlled by connoisseurship, the art market and the art museum. The connoisseurs of this art form and their discourses of appreciation were, and for the most part still are, quite different than those typical of museums or markets. While the market for them, both a popular one that got its art cheap or for free, and the auction house driven rock memorabilia market, are each discursively distinct from museums. And not only are the discourses distinct but the very posters picked to represent psychedelic poster art are in many cases different. This led me to reconfigure the "semiotic square". My new map attempts to account for divisions of labor in the discourse of art previously unrecognized or underrecognized in our culture. Zone four, hyphenated art and artifact, is directed by popular discourses. 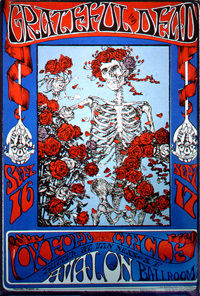 In relationship to collectors of psychedelic posters, these 'folks' like the bands, they often 'read' the language of the images or the combined image and text, they often know some of the history of the event and the era, and they appreciate the access afforded them by a cheap price. As an example, this poster, number 26 in the series of approximately 200 Family Dog Presents series, has been legally reprinted seven times and the recent edition goes for around ten bucks. The image itself was 'discovered' and copied by the artist team Mouse and Kelley from an illustration by E.J. Sullivan in a1905 publication of the Rubaiyat. Popularly, the imagery most often seems to respond to "the great cover-up of death", as Benjamin called it , in a society devoted to working ourselves into the grave, ignoring the infirm and dying, and perfecting our abilities to deal in death. First printings of this poster still only cost about 1200 to 1500 dollars because its instant popularity demanded a huge first printing. Zone three, artifact and Art with a capital 'A', is ruled by era or in-group collectors and contemporary or entrepreneurial dealers. This is discourse generated by or around particular objects by those who are attached to a particular context through these objects. And while they in fact may be best equipped for the game of price appreciation, or the discourse of history on the basis of a detailed knowledge about the works of art, they are often the least recognized because their discourse does not follow the models of zones one and two. For instance in psychedelic posters this might be represented by the Family Dog 89. Set up like the comic page of The San Francisco Chronicle and formally establishing a narrative frame of interpretation which reading defies, the poster is full of unintelligible dialogue balloons and superficially familiar images that are difficult to decode. It is full of era references repudiating mainstream culture, for instance the doubly cynical Camel ad which reminds the viewer of the poster's ultimate intent despite its rather profound artistic camouflage, while referencing a dangerous drug legally inhaled by many Americans. 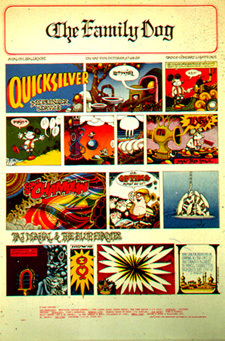 It also references underground comics widely popular at the time. It is doubtful art museums would be interested in explaining this poster. Additionally, while this is not the case with all the posters appreciated in this zone, a first printing is in the hundred dollar range. Zone two, of commodity and hyphenated art, is the zone controlled by the discourses of commodification, speculation and worth determined by the bottom line. It is also the zone ruled by Culture with a capital 'C' because exemplary culture in the U.S. is almost always coded with the discourse of 'superstar' status and financial power. The object is usually distanced from its historical context which is replaced by a shallow or narrow association with a person or event, e.g. Jackie-O's pearls or an impressionist painting. 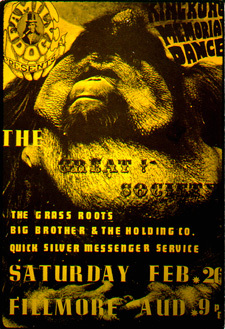 A classic example from the psychedelic posters is Family Dog 2. This poster, which was done at the last minute partially with prepackaged lettering, is not exceptional visually in any way. Yet, because it was disliked and printed in very limited quantity, it is rare and worth three to five thousand dollars, perhaps more to a collector with money and an almost completed set Family Dogs. But more importantly, art museums have not yet been interested in attaching aesthetic value to it. Finally, in zone one, Art with a capital 'A' is connected to a rare commodity and controlled by the mythologies of academic aestheticians and art museums. This is the zone of the discourse of form and artists abilities to express themselves therein. Though guards and technological surveillance remind the 'folk', that is, museum goers that the works they see are the ultimate commodities, they are disciplined to respond to them as 'priceless' through a discourse of aesthetic appreciation. Historical content enters the discussion as a side line, as particular quirky features of a particular time that amuse or entertain or inspire nostalgia in us in our present state of cultivated achievement, which is always far more advanced. Family Dog 86, popularly known as "the flower pot", a title to which several puns inhere, is an excellent example. It has made it into the few museum shows these posters have gotten. The powerful image very clearly formalizes some of the visual aspects of psychedelic experience, e.g. the visual sparks created by adjacent contrasting colors or the apparent movement of still forms. Given what we now know about the system of appropriation, it makes sense that works such as this, which already represent the challenges 1960s counter-culture posed to the dominant culture in abstraction, would be the first to be admitted. They internalize the museum's disciplining making its workers jobs easier and allowing them to begin sooner. 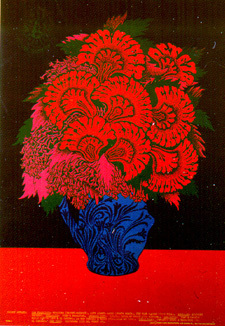 Interestingly, the artist, Victor Moscoso, was one of the few poster artists with extensive formal training. This poster was quite popular however, and the production surfeit has minimized its rarity. In this paper I have attempted to demonstrate how the framing of particular objects both within institutions and through the broad, indirect and diffuse discourses they generate can transform the signification of both sign/ objects and signifiers. Clearly the appropriation of objects across the social divisions as well as across cultures is a human attribute that will continue to condition them. Museums, markets, dealers and popular audiences do not intone a monologue regarding art. I hope this paper will help to further identify and differentiate cooperation, contestation and consternation between contexts in which the meaning of objects is made manifest.